The Baron Series Wealth Building Newsletter is a valuable companion to the international best-selling book, The Baron Son. Its compelling lessons will help you accelerate your wealth and grow your million-dollar business faster. You will also receive word of our newest publications and exclusive online offerings in the subject areas that interest you. 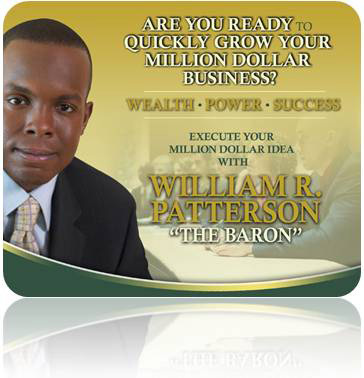 The Baron Series Wealth Building Newsletter is administered by the online marketing team and powered by MailChimp. Both The Baron Series and MailChimp are committed to providing a user-friendly and spam-free experience. List Member Control: You are in complete control of your subscriptions. Only at your request will you receive The Baron Series Newsletter, and at any time you may unsubscribe by following the instructions included in every issue. Unsubscribing: At the bottom of every e-mail message is a link that you can use to cancel your membership or to change your interests or the optional demographic information. If you need help unsubscribing, please email us. Privacy: Neither The Baron Series nor MailChimp will sell or rent your name or e-mail address to any third party. 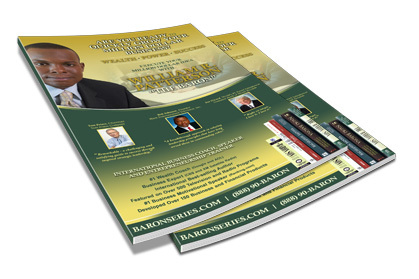 Therefore, you will receive no unsolicited e-mail as a result of subscribing to The Baron Series E-Newsletter. Formatting: The Baron Series E-Newsletters are HTML-formatted with active links to www.baronseries.com. Subscribers with text-only e-mail will receive text-only versions. BARON Business Coaching Success Story: PCOS Challenge, Inc.
How to Create a Six-Figure Passive Income Doing What You Love! Are You Using These Hidden Assets to Increase Your Income? How Will the $700 Billion Rescue Plan Affect You? Make a Fortune During the "Mother of All Crises"
Are You Prepared to Survive & Profit in a Recession? What Makes a Great Investment Opportunity? THE BARON SOLUTION™ Minute is a weekly video and audio vignette offering invaluable business, personal finance, and success information based on the international best-selling book, The Baron Son, by wealth coaches William R. Patterson, Vicky Therese Davis, and D. Marques Patton. On your TiVo Series 2 DVR, Select - Music, Photos, Products, and More - Podcaster. Enter www.baronseries.com/podcast.xml and give it a "green thumbs up" to add it to your Favorites list. See issues of Exceptional People, Money ‘n Profits, Opportunity World and African American Lifestyle magazines to read the articles from wealth coaches William R. Patterson, Vicky Therese Davis, and D. Marques Patton.